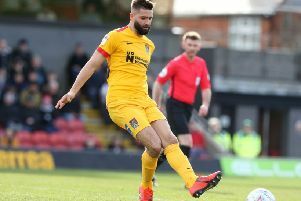 Winger Daniel Powell says new Cobblers boss Dean Austin has quickly boosted belief and confidence at Sixfields, and given the players attacking freedom. The 48-year-old was named the new Town boss on Saturday morning. signing a two-year contract to become Jimmy Floyd Hasselbaink’s successor after impressing in a five-match spell in caretaker charge at the end of the Sky Bet League One campaign. Austin couldn’t stop the team from being relegated though, but Powell is thinking positively as he prepares for life in league two, and made it clear he has been impressed by Austin. “Since Dean has come in, it has been more positive and results have been gradually getting better,” said the former Milton Keynes Dons man. “The few wins we had under Dean has given a lot of confidence to the group. And he added: “Dean has given us belief, more confidence, and we are playing a bit more expansive and creating more chances, and getting a few more goals. “The wide players definitely had more freedom. Austin certainly has plenty to work with, as 23 players are already contracted for next season, and Powell believes it is imperative the squad stays together if the team is to win promotion at the first attempt. “I think it is important we try and keep as many players together that we have here now,” he said. “It is going to be tough, but I think if we can do that and keep the squad together we will have a good chance next season. Powell enjoyed a mixed first season in Cobblers colours, although he did finish the campaign strongly. He is now hopping he can show more of what he is all about when the new season kicks off in August. “The season didn’t start too great, but I think it might have ended up finishing a bit too early for me,” said Powell. “I started getting into form as Dean came in, and hopefully we can take that into next season.